Mediation – An Alternative to Court! Mediation plays a big part in what we do here at Franklin James. We would rather resolve a dispute through amicable communication, as opposed to heading straight to court. If your customer has a dispute with your product or service, this may be the reason for non payment. It can often lead to awkward discussions and a breakdown in communication. 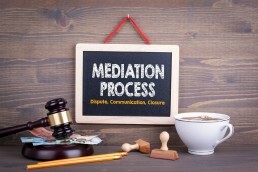 Mediation is an alternative way for you to resolve a dispute quickly, without having the expense of going to court. It’s a much faster process than court too! Its confidential, its less expensive and it allows you to come up with creative agreeable solutions to your problems. 85% of mediations’ are successful! So before you take your case straight to the small claims court, consider how mediation might help you! You have a problem or dispute that you need resolving quickly. Both you and the other party agree to mediate & you find a mediator. You gather your information together & both parties meet with the mediator. During the session, both of you will explain your side of the story /issue. Discussions with the mediator in private and joint sessions will take place. Next in private sessions, is to brainstorm agreeable options and solutions to come to an agreement. Both parties negotiate a win-win solution, that both are happy and can agree to. An agreement is drawn up. Paula Bolton – One of the partners here at FJCM, has been studying people her entire life. Part of the inner success of FJCM has happened because of the daily mediations’ that take place for our clients. Paula is an accredited Civil and Commercial Mediator. Her qualification was obtained through a leading national authority in Mediation, accredited by the Civil Mediation Council and CPD Standards. Sharon Stevens – Also a Partner at FJCM, has a 100% recommendation rate. Meaning that Sharon has been recommended by every single client. With over 25 years experience in the debt industry and alternate dispute resolution, this makes us a great company to resolve disputes for you.